The first 10-15 minutes of every show are an extended commercial about the show. To be honest I started listening to about six episodes, but never got through the commercial to the actual content. There are so many astronomy podcasts available that jump right into the content; I just skipped to those. The Space Show pulls together a wide range of experts from a number of different areas in space exploration and development. If you want to really get up to speed with all things space development, listening to the Space Show will really help you understand all aspects. If you’re really serious about understanding the field, look back at the many years of interviews in the archives. A gold mine of conversations with space professionals throughout the space industry, thought leaders and others at the forefront of our future in space. Many years worth of podcasts (that you can search through on their website) to gain knowledge and insight that would otherwise take a lifetime to acquire. You can adjust the playback speed and jump past the repetitive info at the beginning of the podcasts to make efficient use of your time. The podcast is a live show that you can call (or email your questions) and interact directly with the guests. Info and opportunities you can't find anywhere else. I work in the industry in Mojave and listen to all the episodes. Big variety. Can get a bit political which I dislike but the space content is second to none. Jam Packed With Space Goodness! There a a number of good space-related podcasts that cover the highlights but The Space Show shines by bringing you in-depth coverage of space topics. Week after week you'll get hours of coverage to comb through. The wide range of guests will surely offer something for eveyone. I don't know how this guy manages to pull it off, but he makes one of the most interesting and amazing subjects in the world into a sleep-inducing snore fest. On the show I listened to, he spent almost EIGHT (count 'em! EIGHT!) full minutes at the beginning of the show just prattling on and on about the show, its website, his non-profit foundation that you can donate to, the schedule, his email address, the website address, etc. And URLs are delivered in his typical dynamic style (and I quote): "H T T P colon forward slash forward slash the space show dot wordpress dot com all one word no spaces" Nobody types in "HTTP://" these days, you don't need to say "forward slash" since all slashes are forward-slashes unless noted otherwise, and the World Wide Web is 25 years old, so I think we've all figured out by now that URLs are all one word and don't contain spaces. He also spent too much time at the beginning of the show telling us everything we couldn't do with it, such as: "No written transcripts, even if it is for your own personal use." I've got news for you, buster! If I could keep myself awake long enough to do it, I'd MAKE a transcript of your show, just to spite you! It's called "Fair Use"; it's a principle enshrined in our copyright laws. Once I got past those initial eight minutes, the show didn't improve much. He's a poor interviewer and a worse conversationalist. He breathes into the mic. He's constantly rustling papers. Save yourself some anguish and skip this one. I like the show usually, but I have to turn if off when Dr. Livingston goes on and on with his denial of climate change. Great show with amazing guests. The background noise is sometimes over the top - breathing, keyboarding, rustling etc. A Push To Talk switch or something similar would work wonders. Other than this usually minor issue, this is a five star program. Thank you for sharing all the great info! Show is great. Listener from Poland. More nuke propulsion, please. Want to learn about humanity's future. It has arrived. On this show. Amazing collection of guests: astronauts, scientists, rocket designers, space entrepeneurs. Good work, Dr. Livingston. I started listening to The Space Show in college and now I work in the space industry. 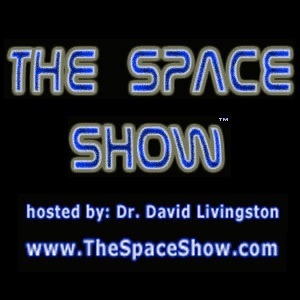 Listening to this show has given me a leg up on other engineers and observers of the space industry. I am currently in my master's program at USC because of an interview Dr. Livingston did. If you want to know what is going on in space, listen to The Space Show. dont breathe in the mic!!!!!!! Skip the first 10-15 minutes. livingston, dont breathe in the mic and stop typing on your computer during conversations, holy crap it's annoying. If you address these issues I might actually tune in again and maybe tell people to join me.